After starting a blog, the most daunting task a blogger has to do is to monetize their blog to make money. Blog Monetization is not as easy as it looks and it doesn’t end after placing ads on your site. You need to think about ads placement, user experience, the number of ads, etc. Since blog monetization has been a trending topic in blogger’s world, there are some myths which are stopping many bloggers from making money. I have listed eight such Blog Monetization Myths you need to stop believing and have also provided what to do instead. Once you have stopped believing these 8 blogs monetization myths, you will start seeing some impressive amount in your bank account. No! Not True. You need traffic to make money blogging, but you do not require millions of traffic to your blog per month. Thousands of targeted visitors who are interested in your niche are more than enough for you to make your first $1000 online. It is the most common Blog Monetization Myth I have seen newbies believe. Don’t run after getting traffic from every source of internet. Unless they are targeted, you won’t make enough money out of it. Although display advertising networks like Google Adsense will earn you few cents for clicks of non-targeted traffic, you will spend months collecting your first checkout of $100. 1. Try to rank better on search engines and bring the traffic which has the potential to earn you money. 2. Spend your time on 2-3 sources which generate your maximum traffic. 3. Keep trying new advertising methods to check which stream work best. No doubt, Google Adsense is the best display advertising network, and many bloggers are earning a six-digit income from it. But, it is not the only way to make money online and don’t treat it like the God of advertising. I have seen many bloggers asking me for tips about getting Adsense approved and if they will get shattered when their blog is not approved. And worst of all they will stop blogging thinking it’s not their piece of cake. Grow up guys; Adsense is just a way of monetizing a blog, and there are hundreds of other ways you can make money from your blog. 1. Try Affiliate Marketing. It will change the way you think about making money online. 2. Improve the quality of your site and reapply for Adsense, if you seriously want it on your site. 3. Treat Adsense like every other advertising company, better your site performs the more you earn. Why would you wait for months to add ads on your site? To look like a blogger who is passionate about blogging and doesn’t want to place ads on the site because it ruins your image? What when your existing users will see those ads on your page? Would it make any difference in what they think about your blog? No. Don’t be afraid of placing ads on your site and do it from day one. Let your visitors know that you are earning few bucks through your blog and they should support you. It doesn’t create any difference in user experience, and your blog will be as valuable to them as it was. 1. Add affiliate disclosure page, and tell them you will receive commissions if they use your link. 2. Treat your blog like a business where you would earn a profit by providing a service (helpful articles). Creating an Ebook or Course to sell is the latest fad among bloggers, and everyone wants to follow this trend. It may be a good stream to add some extra bucks to your revenue, but it is not a compulsion. Don’t start researching how to create a course, sell a course, promote an Ebook, etc. It will divert your mind from blogging about your niche to other unimportant things. It could happen that you aren’t a good book writer or storyteller, and your most of the blogging time will be invested in learning them. 1. Write more contents on your blog and build user trust. 2. Refer Ebooks or Courses which you find helpful to your readers. Please, for the sake of Internet, don’t do it. Sites with ads everywhere are annoying, and that’s the reason why everyone is installing adblocker plugins. There are some good places like sidebar, below content, header to place your ads, but don’t do it in every area of your site. And stop displaying those annoying popup ads, they will ruin the customer experience, and there will be no returning visitors to your site. FYI, if you are using Google Adsense, then there’s a limit of maximum 3 Ads on a single page. Update: Limit has been invoked. However, you still need to maintain the ratio of content and ads on a single page. If you are overdoing it, thinking you will earn some extra dollars, then you are at a risk of your account suspension. 1. Keep your site clutter free and readable. No distracting ads. 2. Place ads in areas where they are visible but aren’t disturbing the readers. 3. Avoid popup and pop-under ads. 4. Avoid using link shortening services like ad.fly, LinkBucks. Doing sponsored post works great as a mode of extra income and why not they are easiest and highest one-time income you can make through your blog. But, don’t do it all the time. Your readers are here to learn from your knowledge, your experience and not to buy every damn thing you refer. Doing 1-2 Sponsored post per month and maintaining other quality articles is good for your blog. 1. Do a sponsored post of products you have used and trust. 2. Limit the number of Sponsored Posts to 1-2 per month. 3. Increase the price of a sponsored product so that you make more money with less sponsored reviews or posts. From my experience with affiliate marketing, I have seen that high paying affiliates are those who are either scam or will be very costly. Many affiliate services will give the first-year discount and after that charge multiple times the first year amount of renewal. Also, since the cost of such products and services is high, very few readers of yours will be buying them. Instead, if you are promoting a well trusted & affordable affiliate product with average referral amount, you are more likely to make more sales and earn money. Blogging world examples of this is the hosting affiliate networks. Hosts like BlueHost and SiteGround are entry level hosts and are affordable to buy. They pay you around $50-65 per sale. On the other hand, high-cost hostings like WPEngine are paying more than $200 per sale. There is a huge difference in prices and referral amounts. And those who want to start a blog will prefer buying BlueHost or SiteGround hosting service. This way you can make more sales and thus more profit. No need of ‘what to do instead’ section. Already explained those points above. And the last myth about blogging is that you need to spend money to make money. It is just another tactic by pro bloggers to get you to buy more of their affiliate products and courses which you don’t need. Starting a blog costs as low as $10/year (with NameCheap Hosting and Godaddy domain) and that could be the only investment you need to build and run your blog. Free themes, plugins, and guides on the internet will do most of the work in growing your blog. It’s a personal choice if you want a fancy theme and plugins to personalize your blog. But there is NO compulsion as such that you need to spend money if you want to make money online. 1. Try to cut down cost in your initial period of blogging. Find the free alternatives and work with them. 2. Start posting quality contents, promoting your site and buy those premium themes and plugins once you have made enough money through your blog. 3. Spend money on only those tools which are providing something helpful in fueling your blogging career. 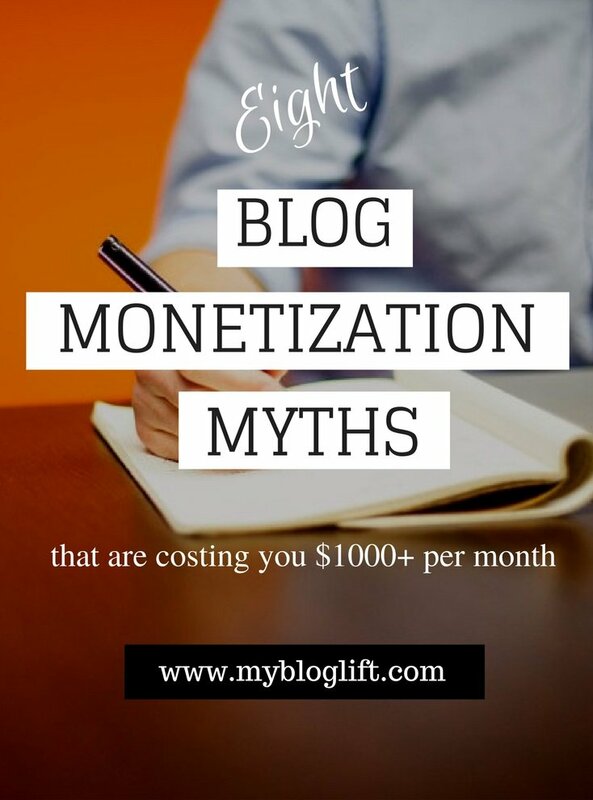 These were 8 Blog Monetization Myths I have seen many bloggers believe and are not able to make money through blogging. The purpose of this article is to aware new bloggers about the reality and stop them from believing them. Do not forget to share this post if there was any one of the myth you used to believe. It will help many others like you and me. Also, comment and let me know if there are any Blog Monetization Myths you or your friends are believing and I haven’t included in my article. Yeah, I will. Keep visiting and commenting Santosh. Excellent article, thank you for sharing! I also feel more like writing excellent articles than creating my own products. Not to talk about Adsense, it just looks ugly and distracting. Will try the affiliate way. Greetings from a greenhorn blogger from Germany! Thank you for these tips. I’m learning as much as possible and these myth busters are so very helpful. I see a lot of information is out there to help bloggers get started, but most use their blog about blogging as the example. It’s hard to find good advice that is applicable for a broad range of niches and this filled that role nicely. Nice article sir… Your Blog and its Posts are awesome ! Just saved your pin! Welldone. Can you list some alternatives to make money without Adsense?